Karen Tramontano, Founder and President of the Global Fairness Initiative (GFI). Globalization brings opportunity, but not for everyone. A partner in the Clinton Global Initiative, GFI’s premise is that economic globalization can and should work to improve the lives of impoverished populations around the world, creating jobs and economic opportunities. A key to their successful implementation of international projects is GFI’s work to forge critical relationships between stakeholders and facilitating dialogue often when it seemed impossible. Karen’s background has prepared her well to do this work. 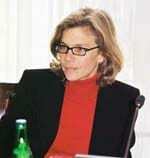 Karen served as Assistant to the President and Deputy Chief of Staff to President Clinton from 1997 to 2000. In 2001 she served as Chief of Staff for President Clinton's transition, establishing his non-profit. She is a Principal at Dutko Worldwide, a strategic government relations and public affairs firm. Listen to this episode of Leading Conversations with Cheryl Esposito to learn more!